Hitched a ride with a couple of friends from the grognards podcast up to Garycon Last week. We ended up off-site at one of the myriad one-star motels that surround Lake Geneva. Unlike my friends who packed their schedules from 8 AM to Midnight. I tried to only sign up for a couple of things a day. Thursday morning was spent in the dealer's room, the afternoon going through the Garycon adventurers league first tier two adventure, and the evening listening to Larry Elmore pontificate. Friday I flew with the dawn patrol in Fight in the skies (Its a good system, but I hate flying allied planes in 1916) picked up the second Garycon adventurers league tier two adventure, sat in on the Greyhawk fan panel, and searched for the Source of the Nile. Saturday saw the third and final Garycon adventurers league tier two adventure, an Empire of the Petal Throne Dungeon boardgame variant (don't be picked up by the pale legion, you'll regret it), and watched D&D cartoons with Ernie Gygax in the evening. Sunday saw a trip through the Jakallan Underworld hosted by the head of the Tekumel foundation Victor Raymond. Because I had not booked my schedule full I was able to play in pick-up games of Index Card RPG and Ragnarok, watch people rolling up random treasure for First edition D&D (so much more exciting than treasure points) and chat with numerous folk (including Matt Finch and Anna Meyer) throughout the convention. Good times. However, I could have done with a bit more sleep than my gung-ho companions' schedules and our off-site location allowed. My star ratings are based on a quick flip through of the games which are mostly pdf files on my hard drive. They are somewhat capricious based on my initial impressions. I wanted to focus this list on RPGs so I have not rated items that turned out to be board games, miniature games, card games, campaign settings, or anything else other than an RPG (I may remove these from the list in the future). I guarantee I have called someone's RPG baby ugly. However, I do have some specific things I am looking for. Overall I am interested in systems that generate characters quickly, have rules that are simple to learn, but have enough complexity to make the game interesting in the long haul. I am more interested in campaigns than one shot adventures so character advancement is important. "Fifth edition Dungeons and Dragons (5e)" is my current go-to game, so an important consideration for any game is what does it do better than 5e. Since this is a review of rules I focused my attention on character creation, combat resolution, and spell casting. Rule sets vary in size from 1-page microgames to 400+ page tomes. Most of the games under 10 pages lacked enough complexity to sustain a long-term campaign and keep it interesting, so were rated lower. 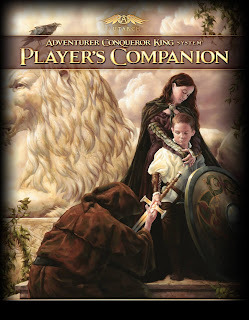 The 400+ page ones were treated more leniently as long I could find a core 20-30 page rules section which spelled out the base rules (a good table of contents helped with this immensely). The ability of the rules writer to explain things clearly and concisely without excessive use of acronyms and jargon was important. I have a great deal trouble with so-called "story games" as many of these reduce the resolution to a single dice roll, and also expect character reactions to be determined by dice rolls as well. One of the things I enjoy most about roleplaying is people working together to cooperatively solve problems, so games emphasizing intraparty conflict did not fair well in my ratings. I am biased towards fantasy settings, so modern and post-apocalyptic settings got rated a little lower (steampunk and hard sci-fi probably are somewhere in-between). I definitely have an opinion on which dice rolling mechanics are best. D20 is my favorite as the probabilities are easy to calculate and one can add a significant number of modifiers without skewing the rolls to badly. D100 is next although since most of the games I see are doing things in 5% increments so they would better just using a d20. 2D6 can work but probabilities here are no longer linear and adds greater than +3 seriously skew the results. A number of games are dice pool based, calculating probabilities for these games is a serious challenge which make them not my favorite. Dice pool games where all but the top few dice are ignored have some possibility. Dice pool games which count the number of successes by the number of dice exceeding a certain number seem workable as well, but don't try to sell me custom dice with plusses and minuses, or funny symbols. Rolling dice pools and adding them together seems the road to disaster as the chance to beat 1d6 with 2d6 is less than 10% adding more dice just makes it more likely you'll roll closer to average with each and decrease these odds. Some systems which limit the range from 2d6 to 4d6 with the assumption that the two dice roller is a novice who is going to probably fail and four dice roller is a master who is going to succeed are barely tolerable. Once you start throwing in extra dice when high numbers are rolled, low numbers canceling out high numbers, and different color dice doing different things calculating probabilities becomes challenging in the extreme, but it probably only slightly shifts the one die versus two dice inequality. P.S. Blogger refused to accept my MSword formatted table, so you'll have to accept a text based layout for now. Since Monte Cook is launching a reprint Kickstarter, I thought this would be a good time blog my impressions about the Invisible Sun Box set I received in August. Invisible Sun feels to me like someone took Ars Magica, Over the Edge, and D&D Planescape put them in a blender and hit frappe. Everyone is a magic user a strangely dark and twisted realm filled with portals to other dimensions. As with many Monte Cook things, the pretention is strong in this product (see Jeff Rients I got your threefold model right here, buddy!). This time Monte has cranked it up to 11 with a custom box for the game and claims of all new roleplaying experience. Unfortunately, as a collector, pretention is one of my weaknesses. Although I was able to resist the first Kickstarter, once it became apparent last February that: first, they were actually going to deliver this game; and second they might sell out the first print run; I put my pre-order in. Unfortunately, this put me absolutely last in the delivery queue but in August it finally turned up (My Sooth desk showed up a couple weeks after I placed my order). Here are some pictures of the Black Cube and what lies within. Not pictured Character sheets, DM Ref sheets, cards, numerous wooden tokens, and a Sun Tracking mat for Sooth Cards (The Sooth Cards are sold separately). I have flipped through the rules, but as of yet have been unable to grok the system. It appears not to be the Cypher system since there appear to be only two stats in instead of three (I may have misread this). I will endeavor to probe the mysteries of this game further once my shoulder injuries from manhandling the cube heal (The weight of this cube put the former Monte Cook heavyweight Ptlous City by the Spire to shame). Was it worth the 300+ bucks I paid for it? In terms of owning something unique, my friends won't have yes. The pretention aspect is failed a little in the ability of the cardboard cube to withstand the weight of the items inside, mine is showing tears where some of the shelves join the walls of the cube. The game seems to have a few more moving bits than I like based on all the components included. Being that Ars Magica and Over the Edge are two of my favorite games if I can figure this one out it may be one of my favorites as well. P.S. Not that surrealist actually require lots of rules, my friend Jeremiah's Fabulous Unknown City campaign was played nominally using 5e rules. I played a six-foot-tall white lab rat (descended from a sentient race created when one of the longer players alchemy experiment took an unexpected turn) barbarian who wore an Elizabethan ruff and a gold jumpsuit. It was no use mapping the City because it re-arranged itself every week. Jeremiah's far tamer Game of the North is available here (although the random items table does give you some of the Unknown City vibes). Went to GenCon for Friday. Got to Gencon about noon. Spent a half hour for an open parking lot. Spent another half hour hiking the mile from where I parked. After another 15 minutes in the will call picking up my badge, I ate pizza for another 1/2 hour and hit the dealer's room. Started at the western end and stumbled out the eastern end when the room closed at 6:00 PM. Marched the loot out to the car. Was going to go to the ENies, but decided I was so tired I just drove home. Observations: The dealer's room is dominated by board games. Many of the roleplaying games I had already picked on Kickstarter. Purchases included: the three Forge World indexes I didn't already own, the rolling miniature case from battle foam, Knights of the Dinner Table and Girl Genius comics for she-who-must-be-obeyed. I picked up two 5e supplements on what to do with monster parts. Demoed a pirate card game and listened to a sales pitch for a gaming table (mostly a for a chair to sit in). Failed to connect with much of anyone (other than two random gamers for lunch). I am getting too old for a Convention this large. Meandering on the web has taken me to this interesting find. 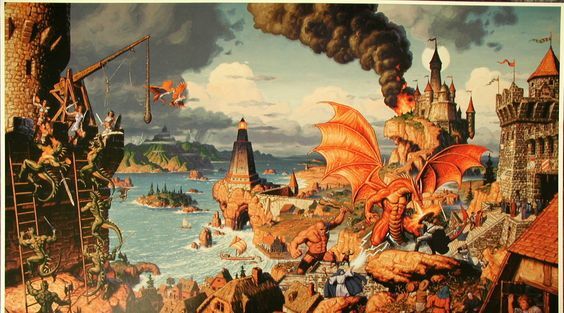 While browsing pixel art on Pinterest, I felt the urge to go looking for art from my favorite Ultima games. This led me to the Ultima codex gallery, a marvelous website with all sorts of cool stuff I will explore later. However there I stumbled across this page "Ultima Resurrection" which contains a zipped version of a tabletop RPG version of Ultima. There is also a link to a host site for this game. Being interested in all things Ultima, I downloaded and took a look. Based on a quick read through it seems to be a playable and viable game. Unfortunately, it based on Ultima Ascension and Ultima Online my two least favorite Ultima games. Like Ultima Online, it is tri-stated and skill-based using skills rated from 0-100. One advances by using skills. Unlike the computer game, this is at a fixed rate rather than a random shot. I think this advancement system is workable but will require a lot of bookkeeping. It is subject to the same skill spam breakage techniques that soured me on Runequest. Combat goes as follows: the attacker makes a skill check against one of the combat skills (archery, fencing, mace fighting, swordsmanship, or wrestling); the defender gets a chance to parry if he has a shield; if the attacker is successful hit location is rolled; damage is determined by rolling the dice specified by the weapon; damage is reduced by the armor rating of the armor at the hit location plus the shield if a successful parry is made. Magic has four different systems: Ethereal Speak, Ethereal Lock, Spell Book Sorcery, and Ritual Sorcery. Ethereal speak is an impromptu magic system based on words of power. Fortunately, Ultima has a nice defined set of words of power. However, adjudicating their combined effects on the fly may prove challenging. Ethereal Lock is like Ethereal Speak but uses virtue points to make the effect permanent. Spell Book Sorcery is a defined list of spells with defined mana costs and required reagents (from the Ultima Online list of eight reagents). Ritual Sorceries are special spells which can only be cast while possing specific items in certain locations. If I run this game I may limit the players to Spell Book Sorcery. There is a nice bestiary, although for some reason it is located in front of the character creation and how to play the game. Overall this is a very good adaptation of the Ultima Online game to the tabletop. The power word spell system has some potential if the game balance can be worked out. The ritual sorcery has great potential for creating quests and adventures. I would have liked a little less bookkeeping. The game mechanics will fail in the same method as the online game (i.e. people will spam skills to gain; the only way to have high hit points is to have a high strength so all high-level monsters hit like trucks). However, this is still the best tabletop version of Ultima Online I have found. If I don't play it outright, I'll definitely mine for ideas for other game systems. P.S. There is also an Age of Shadows supplement, but I haven't looked at it yet.